Fill out the Registration form below. Hot vegan/vegetarian lunch included with registration fee for pre-registrants (please register by Friday noon). See agenda page for the day's schedule. We're looking forward to a great 2012 Annual State Convention in Worcester this November. 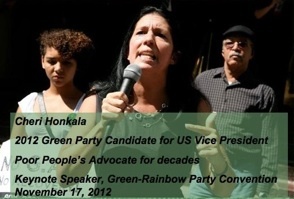 Cheri Honkala will be our keynote speaker! We will congratulate and thank Scott Laugenour for running an excellent local campaign that excited everyone around the state. We will also welcome back Jill Stein to Massachusetts after a spectacular national campaign that was heard around the globe. And we will meet the dedicated volunteers who have worked behind the scenes all year on these campaigns and on keeping the party going. We'll roll up our sleeves for the next stage in our growth and advocacy for people, peace and the planet. hearing from several candidates about electoral politics. Also, there is still time to help with the convention! We need GRP members like you to keep the event running smoothly, so please volunteer! 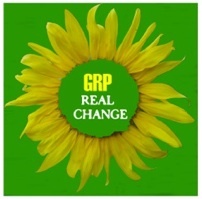 2012 State Convention - Green Rainbow Party: "...of the people, by the people, for the people" http://t.co/g3MHAQ2T GRP Real Change! I didn’t really cancel! i had double RSVPed and someone cleaned up the list. Same for Scott Laugenour! We’ll be there!